Pitcher Spins Away from Batter - Legal Delivery? NOC Tonkawa junior college pitcher Trevin Michael's unique windup and delivery has spurred discussion as to its legality as, with his right foot in contact with the pitcher's plate, he spins 360° and away from the batter before throwing the pitch. Is this a balk or a legal maneuver? 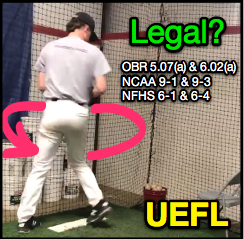 The following discussion is broken down into three levels of baseball: we'll start with the professional level and OBR, move to NCAA—college, and conclude with NFHS—high school. Michael's Move: First and foremost, before the rules discussion, let's begin by stipulating what, exactly, our pitcher is physically doing. He begins with his right foot (pivot foot) on the pitcher's plate and his left foot (free foot) in front of and to the left of the plate. He begins the delivery by taking a diagonal step back with his free foot, which lands behind the rubber, then rotates on his pivot foot, which may or may not break contact with the pitcher's plate as he spins on it. As he completes his 360-degree spin, his pivot foot parallels the front edge of the rubber while his left leg kicks out and he throws his pitch. The pitching hand stays in contact with the ball the entire time. OBR: The Official Baseball Rules for the pros (and Little League) authorize Windup and Set positions, and we see a pitcher working out of Windup here: "The pitcher shall stand facing the batter, his pivot foot in contact with the pitcher’s plate and the other foot free...He shall not raise either foot from the ground, except that in his actual delivery of the ball to the batter, he may take one step backward, and one step forward with his free foot." OBR 6.02(a)(5) is the "illegal pitch" balk, and Rule 5.07(a) Comment states, "The pitcher may not take a second step toward home plate with either foot or otherwise reset his pivot foot in his delivery of the pitch. If there is a runner, or runners, on base it is a balk under Rule 6.02(a); if the bases are unoccupied it is an illegal pitch under Rule 6.02(b)." Related Post: Carter Capps Throws Illegal Pitch, Ejected After Hitting Ump (6/26/17). SIDEBAR: As for twirling around, even with his back to the batter, we know from the days of Hideo Nomo that this, on its own, is a legal move. Naturally, Nomo maintained a legal pivot foot during this motion. We also stipulate this is Michael's natural movement, which he is not interrupting nor altering. If this is coming out of the blue on his 50th pitch of the game, we can deem it unnatural, but if this is what we see as the first pitch of the game, it pretty much establishes this as a natural move. Does F1 "reset" his pivot foot? Take a look at the accompanying animated GIF: Has Michael "reset" his pivot foot? If all the pitcher has done is rotated his pivot foot, or spun on the foot, then he is legal. If he has actually hopped on his foot or "reset" it, then we have a balk. This is no Carter Capps crow-hop, and it appears our pitcher is doing his best to maintain contact with his plate using the toe of his pivot foot. If he executes it correctly in this manner, his move is legal under OBR. NCAA: Prepatory to the pitch, the college book wants the free foot "touching or behind (breaking) the plane of the front edge of the pitcher's plate." That suggests Michael's free foot, in front of the front edge, is illegal (penalty: illegal pitch if no runners are on base, or, a balk if runners). But let's assume Michael can easily correct this issue of pre-pitch free foot placement—let's talk about the delivery itself. NCAA is better than MLB about the "reset" of the pivot foot rule. Unlike OBR, NCAA doesn't actually use "reset" language and instead states in 9-1-a-8, "The pitcher shall not take a forward step with the pivot foot in using the windup delivery. This is commonly known as 'running into the pitch' and is an illegal pitch." NCAA also makes reference to "habitual" motion (e.g., 9-1-a-2's "the pitcher shall pitch to the batter immediately after making any motion with any part of the body such as the pitcher habitually uses during the delivery," which also appears in balk rule 9-3-g). This means that if he does it every windup, we're good. If he just brings this move out occasionally for shock value, then it's illegal. NFHS: The National Federation rules committee just elected (for 2018-19) to eliminate the requirement that the pitcher's entire pivot foot be in contact with the pitcher's plate, as in 6-1; otherwise, this move would be highly illegal. THAT SAID, Wind-up Position Rule 6-1-2 requires that before starting delivery, "The pitcher’s non-pivot foot shall be in any position on or behind a line extending through the front edge of the pitcher’s plate" (similar to NCAA). The reason for this is that 6-1-3, pertaining to Set Position, requires that the non-pivot foot be placed in front of the front edge of the pitcher's plate (NFHS wants a clear difference between the two). These rules make Michael's move illegal at the high school level (penalty: ball is dead & a ball is added to the count if no runners are on base, or, a balk if runners).